College is not only an exciting and transitional time in your student’s life – but in yours as well. As a family member, you are integral to your student’s experience and success here at UNLV. Visit our campus, join us for events, and welcome to the Rebel family. The Rebel Family Network is a social and networking program for UNLV family to connect with each other and the university through a variety of events and activities. You will receive a newsletter and a chance to connect to campus through volunteer opportunities. 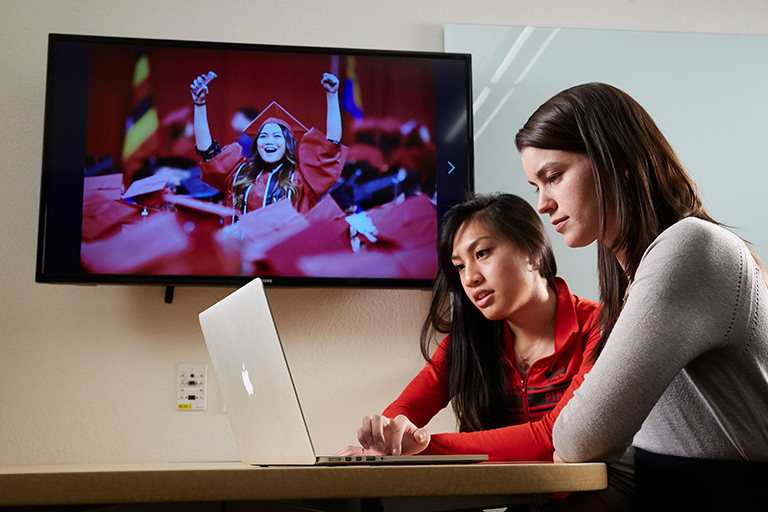 Whether your student lives on campus or commutes, UNLV becomes their home away from home, and provides independence with a built-in support system. We know your student will be working hard at UNLV, but even the best students need help sometimes. We are here to assist them every step of the way — from day one until graduation. Whether kicking off the school year with Premier UNLV or fighting for the right to paint the Fremont Cannon, our Rebel pride shines through. Come to campus to experience these traditions with your student. We can’t wait to meet you! Our goal is simple — help your students be well in mind, body, and spirit. From physical fitness to your overall well-being, we’ve got them covered. Ready to join our family? Here are some resources to help you get started. Show your students you are thinking of them and proud of their hard work. Halfway through the semester, seniors start prepping for their big day. Bonus: Runnin' Rebels welcome new head coach T.J. Otzelberger in true Rebel style. Renowned photographer's large and distinguished body of work encompasses some of the most well-known portraits of our time; tickets are free and are available to the public starting March 16. UNLV study provides an in-depth look at new fathers’ experiences with PPD. Rebels hit the books as UNLV starts off the spring semester. Rebel Girls? Scarlet Dance Line? Come find out a little bit about the national champs rooting on the sidelines. Follow UNLV Police Services simple guide so you know what to do in an emergency.